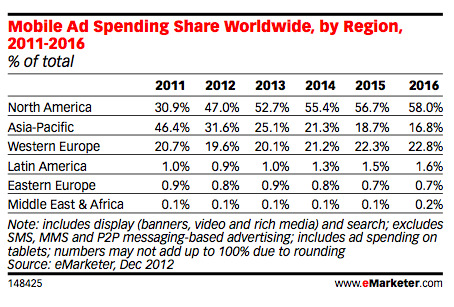 Although mobile ad spend in the Middle East is lower than in most regions in the world, it's expected to grow faster than in any other region worldwide over the next three years, according to eMarketer (shown to the right). Nabd, a personalized aggregated news app in Arabic, is one media product that is doubling down on mobile ads despite the low uptake. Via a partnership with Celtra, a global rich media mobile advertising service based in the U.S. (Other advertising companies in the region offering rich media ads include ikoo and AdFalcon). After Kuwaiti company Waveline Media launched Nabd in early 2013, opening offices in Saudi Arabia and Qatar, the news app now hopes to expand in the UAE as it goes mobile. “The main budgets for Pan Arab campaigns are being distributed from the Emirates, and we want to be there early in the market as ad spend money is going to move from web to mobile, since people are moving from web to mobile,” says Abdur-Rahman El Sayed, Waveline Media's Managing Director. Waveline Media's apps are already generating revenue. Last year, Yabila!, a daily guide to the latest offers and promotions in Arab cities, made US$ 2 million in revenue, while Nabd also did well, says Al-Sayed, although he wouldn't reveal numbers. “We have campaigns in Jordan, Lebanon, Kuwait, KSA, UAE, Qatar, and we are now at the stage of aggressive sales dedicating more force to sell our inventory,” he explains. With 680,000 downloads on iOS (which launched in January 2013) and 190,000 on Android (which launched in August), the Nabd team expects the platform to hit one million downloads by the end of this calendar year. Thus far, users are sharing half a million articles a month on Nabd over social media, says Al-Sayed. The new mobile-focused strategy will see the team focusing on offering Nabd readers more engaging ads, by adopting three intuitive approaches that any startups considering mobile ads might follow. Personalizing the ads for their audience. On mobile, ads are more often irrelevant to an application's topic than they are on web. To avoid that predicament, Nabd is targeting their users by placing ads relevant to their interests, based on their browsing and reading habits. “This enables advertisers to know their target audience well, and with our technology their ad budget allocations can be optimized resulting of an ad spending increase,” says Al-Sayed. This may seem obvious, but often on mobile, the lack of space means that ads are sometimes cornered in a small part of the screen and don't include illustration or animated content. To avoid boring ads, Nabd is focusing on rich media ads, using Celtra's platform to customize them and ensure that they're interactive and engaging. “Rich media ads are the mobile version of online flash ads, but in HTML5,” says Al-Sayed. It sounds funny, but it's a term. One of the biggest problems with mobile ads is that people click on them accidentally, with up to a 50% false rate, an issue commonly referred as "fat finger phenomenon." Especially when ads are placed at the bottom or top of the screen, users accidentally hit them when trying to do something else, and end up closing the window within micro seconds. To solve that problem, Nabd is doing the obvious: making the ad bigger than the finger, and situating it within the text as a native ad. It's also avoid banners, which El-Sayed points out are extremely annoying to users if they don't close at some point in the navigation. “If user doesn't like it he can swipe up and down,” says El-Sayed. 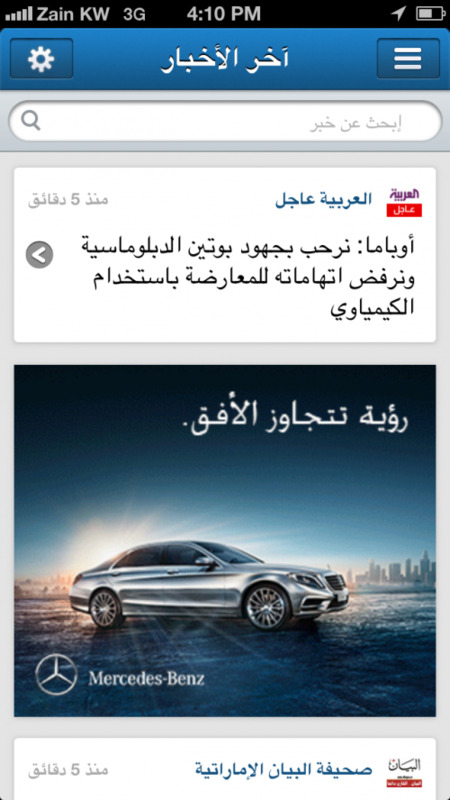 To the right is an example of a recent ad for Mercedes-Benz, which launched a regional mobile marketing campaign on Nabd earlier this summer. Because games are becoming a popular vehicle for mobile ads as well, for the past nine months Waveline Media has been working on a game and “we are expecting it to be a big hit,” Al-Sayed says. 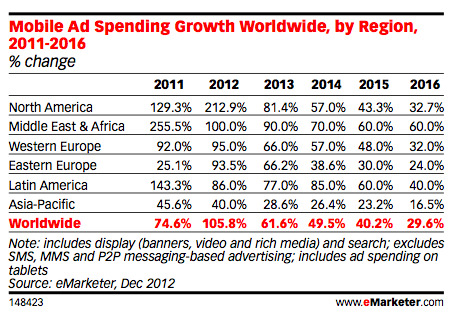 At least companies following in Nabd's footsteps with mobile ads will be able to track its progress.